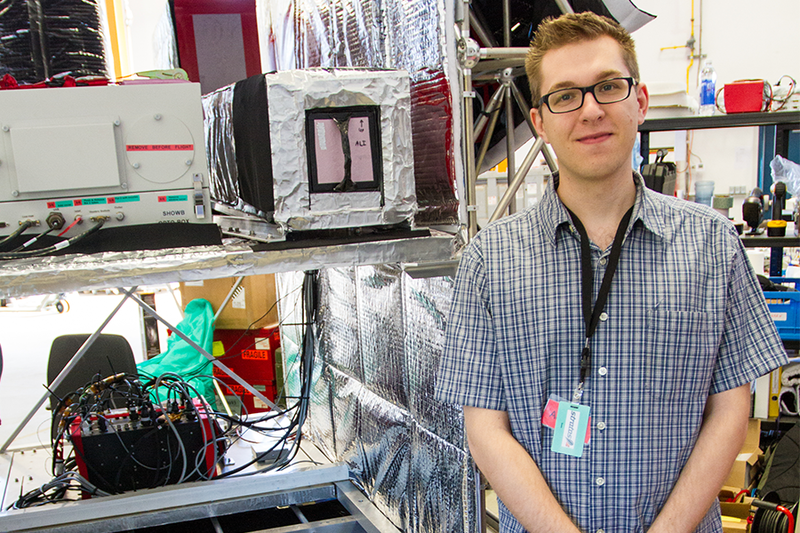 Engineering physics student Brenden Elash is studying the effect of aerosols in a warming climate (photo by Paul Loewen). University of Saskatchewan graduate student Brenden Elash believes the sky holds the secret for better understanding climate change on Earth. Elash, an engineering physics PhD student, is interested in a hot topic in science—the effect of atmospheric aerosol on a warming climate. It's known that aerosols, tiny sulfuric acid droplets produced by volcanic eruptions and from human causes such as pollution from burning coal, can affect our climate. Depending upon how much light is filtered, aerosols can act like a shield to reflect the Sun's rays back into space, thereby cooling the planet and counteracting global warming caused by greenhouse gases. Some scientific models estimate that aerosols have counteracted about half the global warming caused by the build-up of greenhouse gases since the 1880s. In 1991, a massive eruption of Mount Pinatubo in the Philippines lowered the globe's temperature by half a degree Celsius worldwide for about two years. "Aerosols are one of the largest unknowns in the climate balance right now," said Elash. To better map and measure aerosols high in the atmosphere, Elash and his supervisor Adam Bourassa have designed, built and tested a new type of sensor for use in Canadian satellites. The cutting-edge research is funded by the Canadian Space Agency and the federal agency NSERC. In a joint 2014 operation with the Canadian Space Agency and France's National Centre for Space Studies, the team sent the high-resolution imaging instrument into the high atmosphere 35 kilometers above Earth using a special balloon larger than a football field. It was the first time this type of instrument had been used in space and specifically for monitoring aerosols. Elash presented his results at an international meeting last June in Norway. "The results showed that the prototype sensor holds promise as an economical solution for precision aerosol mapping from space," Bourassa said. If the new tool performs well in future testing, it may go into space in five to eight years, he added. Called ALI (Aerosol Limb Imager), the new atmospheric monitoring tool uses a unique optical system to take high-resolution images of the concentration of aerosols in the atmosphere. By using sound waves on a crystal filter, ALI diffracts the sunlight in different colors. Elash analyzed the light in more than 200 images to determine the quantity of droplets in the atmosphere. The measurement accuracy was very close to that of the Canadian OSIRIS, an atmospheric monitoring tool operated by the U of S on board the Swedish satellite Odin. OSIRIS and other satellite tools are getting old and running way beyond their lifetime. "We need new generation instruments like ALI to track aerosols," said Elash, who also has degrees in engineering and computer science. "We need to diversify the type of satellite tools we have to look at the climate change problem from a different perspective." New tools like ALI could help leaders one day decide whether climate-change policies are working or whether additional action is needed, he added. The team now plans to build another ALI prototype for a second space launch testing. Article written by Federica Giannelli, a graduate student intern in the U of S research profile and impact unit. This article first ran as part of the 2015 Young Innovators series, an initiative of the U of S Research Profile office in partnership with the Saskatoon StarPhoenix.